WorldSBK riders head South to Portimao from 27th-28th January for the last European pre-season test. With the first round of the 2019 FIM Superbike World Championship season just around the corner, the WorldSBK riders are not wasting any time, and after Jerez Test some of the teams, who were out testing at the Andalusian race track this week, are now heading South to Portugal to continue their work around Autodromo Internacional do Algarve, Portimao from 27th-28th January. Jerez Test saw many riders improving their paces and showing promising performances. The two-day test finished with no less than seven riders packed into less than one second, and the next pre-season test at Portimao looks set to be a thriller. 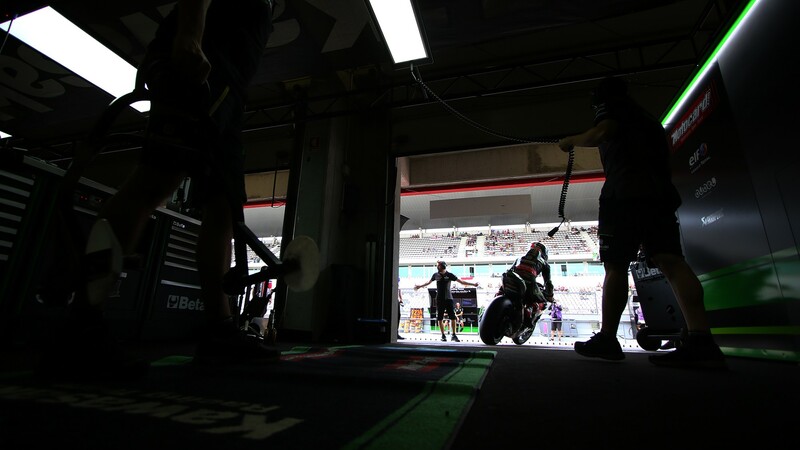 Kawasaki Racing Team WorldSBK team will continue their preparation for Phillip Island testing the new items introduced on their ZX-10RR for 2019. With the Jerez Circuit having been resurfaced over the winter break, reigning World Champion Jonathan Rea had first to find the feeling on the new asphalt before being able to set once more the fastest lap time of the test. Happy with the general improvements done during the two days, he will now look forward to making steady progress and make another step forward. His teammate Leon Haslam put in 157 laps around the South Spanish race track as he worked on getting as comfortable as possible on his new bike. Happy with his improvement as he closed in third position, just 0.348 s off his teammate, the British rider will now head to Portimao ready to work on the race set-up for the first round of the season. It was a strong opening test to 2019 for Alex Lowes (Pata Yamaha WorldSBK Team), who set the fastest lap time on day one and closed Jerez Test just a few tenths of a second behind Rea. With their focus already on the first three first rounds of the season, both Lowes and his teammate van der Mark, who finished seventh overall, will continue to work on the same direction at Portimao, as they prepare to bring on the fight to Rea and the green machines. For the Aruba.it -Racing Ducati team it was a tough test with a lot of work to be done at Jerez. Preparing for his big debut in WorldSBK at Phillip Island, Alvaro Bautista spent the two days getting comfortable on the Ducati Panigale V4 R while gathering useful information to work on and begin setting the bike for his first race. Happy at the end of the test as he finished fourth, less than half a second off to the top, the Spaniard will head to Portugal with confidence and expectation from the next test. Suffering some back pain after a crash he had on the opening day, Chaz Davies did only a few laps on the second day and he will now head to Portimao with the aim to continue from where he left off. Toprak Razgatlioglu (Turkish Puccetti Racing) impressed with his overall pace over the two days. The Turkish rider has been working on the old version of his bike and he will receive the 2019 update only in Australia. Heading now to Portimao a track that suits his riding style, the 22-year-old will look forward to improving his pace once more. GRT Yamaha WorldSBK riders Sandro Cortese and Marco Melandri had two busy days working on their Yamaha YZF R1. The German was pleased after Jerez test as he also closed less than a second off the top of the timesheets in sixth position, whilst the Italian was eighth, and he will continue to prepare for the season opener around Portimao. Jerez Test also saw the BMW Motorrad WorldSBK team taking to the track for the first time with their competitors, but as both Markus Reiterberger and Tom Sykes were focusing on getting acquainted with their new bikes and not on the times, the two riders got their lap times recorded only on the closing hours of the test. Happy with their improvements and the work done with the team, they will head to Portimao with a clear test program to follow. There won’t be only WorldSBK teams out on track at Portimao, as some of the FIM Supersport World Championship riders will return on their 2019 beasts also at the Portugal race track. 2018 WorldSSP runner up Lucas Mahias is ready to continue to get acquainted with his new Kawasaki ZX-6R of the team Kawasaki Puccetti Racing alongside Japanese Hikari Okubo. Italian Raffaele De Rosa, (MV AGUSTA Reparto Corse) another strong contender, will aim to make progress around Portimao race track too. Also, on track there will be the all-French team GMT94 with their strong line up of Jules Cluzel and Corentin Perolari. Watch the highlights from Jerez Test and keep up with all the action from the two day Portimao test from 27th-28th January all with the WorldSBK VideoPass.